HomeChinaWhat Is The Matrix: China's History, Culture, and World Take-over! What Is The Matrix: China's History, Culture, and World Take-over! What is China? And what are some Cool and Gnarly and also Useful facts you should know about China? Well that’s almost as big of a question as a person from Mars (see the book ‘Out of the Silent Planet’ by C.S. Lewis) asking you “Hey, so tell me about Earth! Are there any interesting facts about Earth, such as its culture, history etc. ?” That’s because China has a history as old as Earth’s history, and is a world in itself. But maybe we can condense it into a little story, and give you a happy rundown of the whole situation from my limited perspective and what I have learned so far. I myself personally have actually lived in China for over a year in the past, and honestly, I didn’t know hardly anything about China until I went there. So if you are an American, and you are anything like me, you might find this little hastily compiled rundown helpful. Seeing as that we are about to all be speaking Chinese soon, and all the big news is ‘all about China’ these days and how they’re takin’ over and such, you might want to ask yourself: Just What Is China? Hey, how is it that these people are all of the sudden so big and powerful and able to boss America around and stuff? First of all, I really believe China is a mystery, and not one that is going to be solved without some lost knowledge coming to light. The Chinese themselves don’t know where they came from, and have a very muddled view of their ancient origins, just like the Westerners do about THEIR origins (lots of stuff about cave men and monkeys and hunters). . . That is, unless you find some Chinese who believe in the Bible. Then things begin to make a little more sense. You see, it really begins with Noah, and his 3 sons. Shem, Ham and Japeth. . . plus one other guy. Well guess what? The Chinese to this day consider “The Father of China” in many ways to be a guy named FUXI or FUYI who they consider to be the Father of China. And do you know that in the legend of FUXI in China it both says that he lived during a time of a great flood (like Enoch) and was taken into Heaven (like Enoch) and even that he invented writing (like Enoch did too!). . . hence. . . (drum roll) . . . the Father of China is very likely to be ENOCH, who would have been the very first righteous man since Adam recorded in the Bible! So that makes China’s ancient roots some very Godly and Righteous roots, although they themselves perhaps have lost this knowledge. Shem is the father of all the Chinese, Indians, Jews, and Ham is the father of all blacks, and Japeth is the father of the whites. Then somewhere in between the Tower of Babel and China there was this country called “China” That suddenly appeared. 5,000 years ago! Unfortunately, almost all ancient books from the beginnings of their history were burned in many revolutions and wars. But nonetheless, I consider China and Chinese people to be an ancient Wise Race of people, who possess a kind of very old and almost forgotten civilization and culture that was passed on down even before the days of Israel, Babylon, and Abraham. We’re talkin’ a kind of righteousness similar to that which the Jews had, but OLDER! So you can’t blame’em for forgetting it! Here is another cool fact about their culture: Look at the ancient book, iChing (like iPod, or iPad!) which is also considered to have been originally written by FUXI (who I believe was ENOCH). The system of fortune telling in this book is very similar to the code that our computers are based on, namely, 0’s and 1’s. So when you look through all the hexagrams and diagrams in the book, you will see something that looks like it was written in the future, NOT 5,000 years ago! But alas, from their very beginnings, it seems that this culture HAD or was related to some kind of high tech system! The system of the hexagrams is almost the same as our modern computer codes – – – simple ON and OFF switches of 0’s and 1’s! Don’t ask me what all this means but even a child can see the similarities! So really I believe that all this “modern” technology that we have is only a revival of the ancient codes and ways that were just forgotten because of the flood. But now that we’re getting to the End of History we’re starting to see a revival of them again. Jesus said, “As it was in the days of Noah, so will it be in the time of the coming of the Son of Man.” China was a high tech culture, both in its beginnings and in its endings. China is going to change the world, too, and is already! Did you get all that? I certainly didn’t. But I look at it as much the same way you might look at our European history from before the Roman Times. You would never attempt to stuff all the kingdoms until today into your brain from 5,000 years ago. That’s why I find it a lot easier to just look at it through the lens of the Bible and Prophecy and then the more recent history. What is China Today? That’s like asking, “What is the Matrix?” The answer is the same: “Control.” The Matrix of control that is coming upon the whole Earth! One day the Whole World will be just like China is today. It is a country where the government can spy on you and suppress its people and even kill them just for not agreeing with its political leaders. It’s a place where you are not allowed to have more than one child, and religions receive intense persecution. It’s also a gigantic experiment. Look at it like this: China is a gigantic prison, where its people live in total ignorance that they are even in a prison. Its people think they live in a free country! They say to you: “I live in a free country! We have freedom of religion here!” Meanwhile a couple of local pastors are getting tortured and murdered down the street. But I don’t blame China on this. Actually I don’t think China is responsible for this at all. If you want to know who brought 1 Child policy to China, you need not look any further than the USA! George Bush came to China in the 70’s and helped institute that system of murder. Why would he do such a horrible thing? Because that’s exactly what people like him want to do to the rest of the World, and China is the experiment. A One World Government is coming, and rather than say “China is going to take over the World,” what we should be saying is “The people who took over China are going to take over the world and make it like China, and worse.” For some really good research on this topic, you’ll want to turn to other authors online, and people who have devoted their lives to studying this fact. Look at their glazed robotic looks of giddy happiness. . . very similar to how the whole Obama Campaign was, and how the AntiChrist will advertise himself in the near future! This is why I say that the China of modern times is nothing but a huge experiment of World Governance. 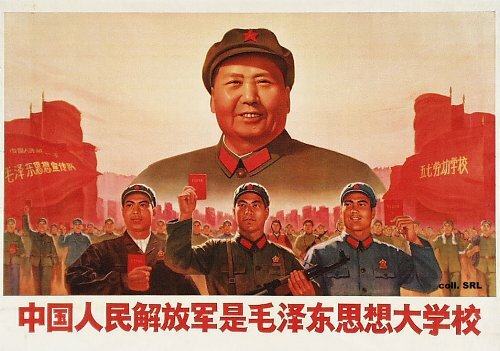 The CIA (or more specifically the OSS) put Mao Zedong into power. He was nothing but a puppet leader. They had a phony revolution about 50 or so years ago, very similar to the way that the media in the States is promoting Obama as the world savior. Obama is a murderer too, but this guy MAO is the biggest murderer in HISTORY, having put over 80,000,000 people to death through their systems of socialized farming and communism. If you are interested in WW2 History and China Secrets, I suggest you start listening to Douglas Dietrich, who uncovered some files dealing with the US Government’s role in shipping narcotics into China, basically drugging people down and screwing everything up, paving the road for the communist government to take over. Here is an amazing site full of research on the modern-day China secret histories and Mao Zedong’s Illuminati/Yale connections. And finally, not to end on a negative light on China as I really do love these people and care about them a lot: I advise you to take this to heart: DROP OUT! Start in your heart, by coming to the Lord of All, and then secretly find ways to Serve Him. Do it China Style, where the Christians have to have church underground! Start in your life today, by changing the world you live around you for Jesus, through prayer, through witnessing to others, and spreading that Gospel around! And ‘Love not your life to the death.’ The day will come when we’ll all have to escape this world, and much in the same way that KMT (The former leadership of China) Had to escape to an island called Taiwan, we are all going to have to escape this world. Start now, live by the Spirit, and BE A NEO by using the New Weapons of the Spirit of God, and living in a world where anything can happen and nothing is impossible! Bless you in Jesus Name. . .